Judging from the 100+ people who "liked" this photo in Google Reader, I wasn't the only one smitten with this Sartorialist snapshot from several weeks ago. But my admiration was also tinged with a hint of a "Great minds think alike!" mentality; for the last month I've been injecting little touches of red here and there in my outfits too. A dash of crimson goes a long way in tying together an outfit, giving neutrals a much-needed bit of colour, or adding some sophistication to a look. Luckily for those of us on a budget, adding a touch of red to an outfit is affordable and achievable. Shoes with a scarlet flourish are a good start. You could also pin a sparkly brooch on a dark coat, swap your everyday watch for one with a red strap, or thread a skinny patent leather belt through your belt loops. Of course, for the most versatility, you can always opt for a red lipstick or nail polish. The collage above encapsulates my favourite ways to add the colour into my everyday looks. What are yours? Would you try this look? A touch of red IS such a great way to add interest to an outfit. Especially soemthing classic like all black or black and white. I usually do this with red lips or red polish. Still really need a great pair of red shoes. That pic from The Sartorialist is awesome! Love that look! I have a pair of red JCrew flats that I just adore because I almost always wear black, so I can at least get a pop of color from my shoes-especially in winter where I'll pair black dresses with....black tights. You need something bright in your outfit! I wish I could still wear them...they don't fit my orthotics so they've been collecting dust in my closet :( I'm waiting for an F&F sale at one of the big department stores in the US to splurge on a pair of Ferragamo varinas instead. I like this! Red is one of my favorite colors, and I love the pop of color a red pair of shoes can give to any outfit. Of course, I still have to experiment with red lipstick... I have a near-unused tube of it in my makeup bag. I think red is a pretty colour too but it can be such an attention grabber and I don't always like that. But lately I've fallen in love with the look of red nail polish so I think I'll start small and go with that first. :) Eventually maybe I'll be confident enough to rock red shoes, haha. I always love adding a red element into my outfits, especially red lipstick. I think it makes such an elegant & bold statement! Great post Lisa :) And I'm STILL coveting those rain boots! I totally agree! Most recently I've been using red lipstick, but I also like wearing a bold red skirt or shoes. I like how you included your Kate Spade rainboots... I saw them on sale at Piperlime but they were all sold out in sizes :( What a great buy! Between those and your Badgley Mischka leopard purse, I am pretty darn envious of your shopping finds! I never check the Sartorialist. I guess I'm missing out! I love red, full on dresses as well as touches of red. Red lipstick is def. my favorite. But shoes are def. the best pop of red, I have a pair of winklepickers in red, that I'm obsessed with. Lisa, I would totally work an inspired outfit from this! I've got cute red shoes from Anthropologie, and a cloche hat to boot! 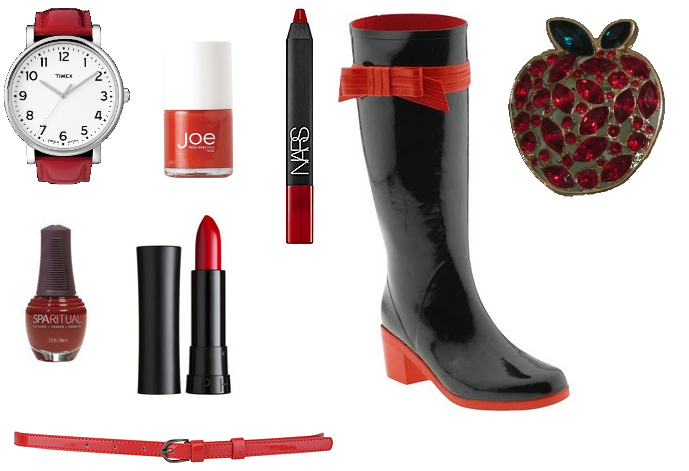 Red doesn't have to be in lipstick or in polish - I really like your red watch - perfect accent!